Having earned some valuable ‘Brownie Points’ with my wife last weekend, I chose to redeem these with what my wife chooses to call “Geek Time”, which in this case, meant I got to spend some time working on my Masters of the Universe conversions. Anyway, as noted in my last post, I had completed the minimal conversion work on my Beats Man proxy and decided to undercoat him. 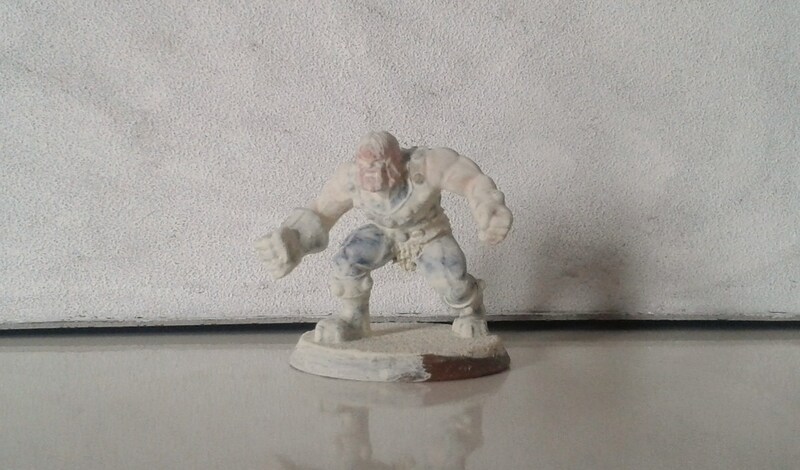 As this is a D&D Miniatures pre-paint, rather than my standard white undercoat, I decided to use Docrafts Linen, which is a similar shade to GW Tanned Flesh, as this was going to be my planned first colour anyway. As the original figure was predominantly painted in dark colours, this obscured a lot of the detail, which can be an issue with pre-painted figures. This is a nice figure! Plenty of intricate detail, buckles, straps, pieces of armour tied on, etc. 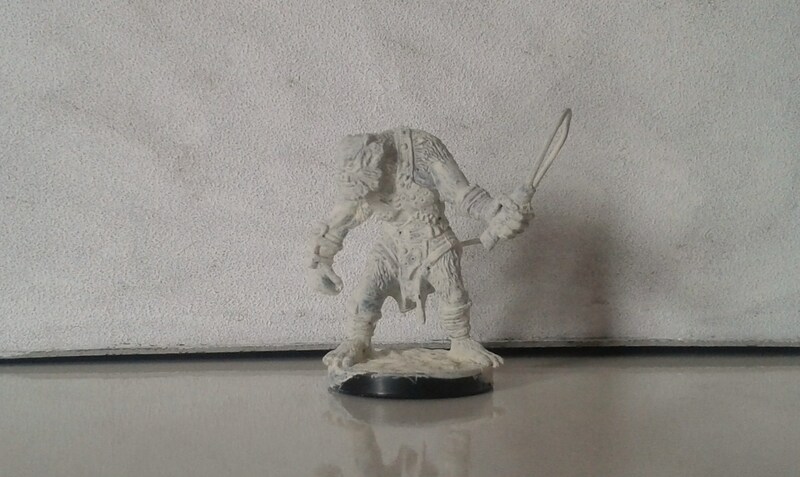 Should you want a champion for your beastman army or need a bugbear, get this one. He’s relatively cheap and very nicely sculpted. However, the undercoated also revealed that what I had assumed was some fur or armour detail was actually some flash from the molding process, so out came the craft knife and this was swiftly removed. He is now ready to join the painting queue proper. Anyway, compared to “Green Stuff”, which I have been reliably informed has the consistency and texture of bubblegum (Cheers, Roger), Milliput is quite coarse, has a shorter working life and prefers to stick to your fingers or tools, rather than the model you’re attempting to add it to, especially when the piece of Milliput is very, very small. So, the idea was to make tiny balls of Milliput, then add them to the front of Fisto’s belt/girdle, to represent the decorative parts of this item of clothing. After much swearing and smears of Milliput ending up everywhere but where they were supposed to go, I decided to come up with an alternative solution. The head of pin was snipped off and glued in place for the central decoration and a thin disc of plastic sprue was used for the smaller decoration. Not quite as good a coverage as Beast Man, but the picture makes it look worse than it actually is. He has also joined the painting queue. Finally, we have Orko. As those who have been following my progress on this will know, due to not checking the source material, I ended up with a partially completed model that didn’t look anything like Orko. As last weekend involved a road trip, in which I was a passenger, I had plenty of time to consider alternative options. 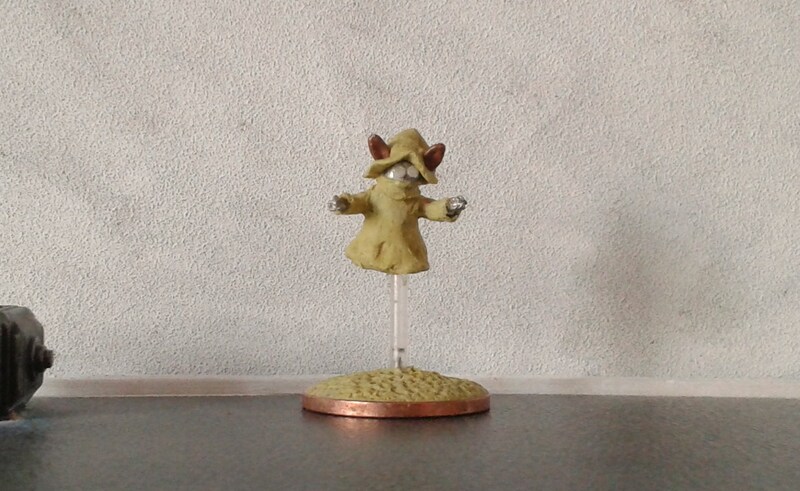 My initial idea was to use a HeroQuest goblin as a base figure, but it proved to be too big. 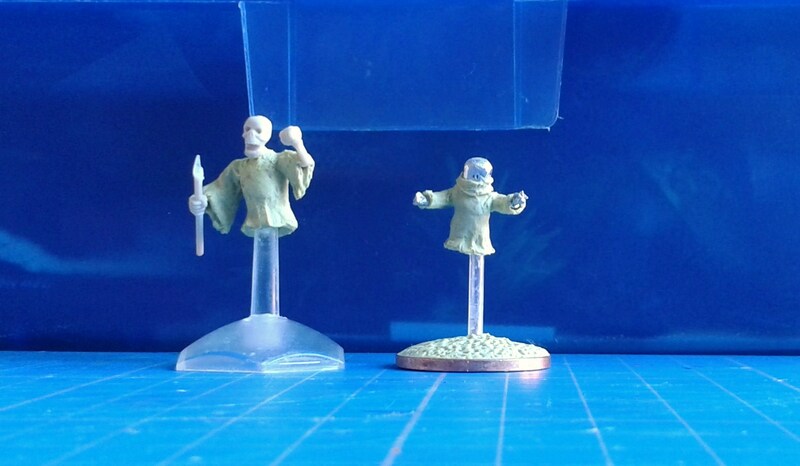 However, a rummage through my box of lead uncovered a miniature that I’d inherited from someone else that I’d forgotten about, which was a Grey Alien from Ground Zero Games. The body was slight enough, even if the head was a little large, so the snips came out and he was debased at the ankles. As this figure now had two pointy “stumps”, I came up with a cunning idea to create a ‘flying stand’, namely a short length of transparent plastic tube, which was originally the shaft of a cotton bud, which was sleeved over one of his stumps. A drawing pin was then superglued into the other end, which was then superglued to a two-pence piece. I then bent the figures arms into a suitably spell-casting pose and filed down his massive head, as although Orko’s head is pretty big, it wasn’t quite as big as the one on the figure. Once the initial sculpting was dry, I then considered what I needed to do next. He needed eyes, cuffs on his sleeves, his hat and his ears. Having already suffered with “tiny ball” Milliput syndrome with Fisto, I knew that there was no chance in Hell that I would be able to sculpt his eyes, so tiny discs of plastic sprue were cut and carefully glued into place, which sounds easier than it actually was. Whilst these dried, I tried to add cuffs, but the curse of Milliput struck again and, after much cursing and fumbling, I eventually decided to not bother with this particular feature. Having already assessed my sculpting ability as to not be up to the necessary skill level to sculpt Orko’s ears, the plastic farm animal box was raided again and a small plastic donkey donated his ears for the cause. A suitably cone-shaped blob of Milliput was then forced onto the head of the model, gently teased into shape, then two holes were made, into which were inserted the donkey ears. A little bit of tidying up and a line scored around the hat to show the two parts, as per the original reference material, and he was done. So, my question to you all is – How cool is that? Thanks for visiting. Comments and feedback appreciated, as always. Yeh, that is pretty cool, if I’m honest! definitely the right decision to start Orko again, your second one is a lot better than your first (not that there was a great deal wrong with that). I think my Orko might be a little on the large side, though after watching a few episodes of the cartoon (purely for research of course!) his actual size in comparison to the other characters does vary quite a bit. Your progress has been very good all round, especially compared to mine, as I’ve been rather lacklustre in my work ethic I’m afraid, but you’ll read more on that when I publish my update. It’s not going to take you two weeks to paint these three up, does this mean we’re going to get some additional figures, before the months out? Actually, It’s very cool (loath though I am to say it!!). I’d say that was super cool, I definitely seeing Orko there! I’m really enjoying your work! I was a big fan of MOTU, and even of She-Ra. Speaking of which, I don’t know if you plan to eventually create versions of She-Ra and the like, but if you do I’d recommend using one of the Crimson Cowl heroclix as Shadow Weaver. Keep up the good work! Thanks Matt. Whilst Roger and I are creating these figures for our own pleasure, it’s always nice to hear that our efforts are being appreciated by others. I’ll have to admit to not being as familiar with the characters from She-Ra, and there are still a few from the He-Man cartoon I haven’t done yet, so I’m sure we’ll be visiting Eternia again.